If you’ve followed my blog for a while, it may be no secret that I like to read a lot of food-related books. You may remember that last year I even compiled a list of 20 Summer Reads for Foodies which included some of my favorite fiction books that are all food related. And I even love to sit down with a new cookbook and page through it as if it’s a novel. I spend time thinking about the recipes I want to make and marking those that are tops on the list. I think about how doable the recipes might be on a weeknight or maybe they’re better suited to a weekend cooking session. But in all that reading for fun, I also like to read fill my mind with information ABOUT the food we choose to eat. I don’t really believe in one-size-fits-all diets but what I do think is that you can never learn enough about the types of foods that are out there and then make your own decisions one what is right to serve for you and your family. It kind of all ties into meal planning too. Being mindful about the foods we choose—and why—can help us meal plan and even look for ways to save money. Short of going back to school to get a nutrition degree, reading up on this topic is an easy way to learn more. 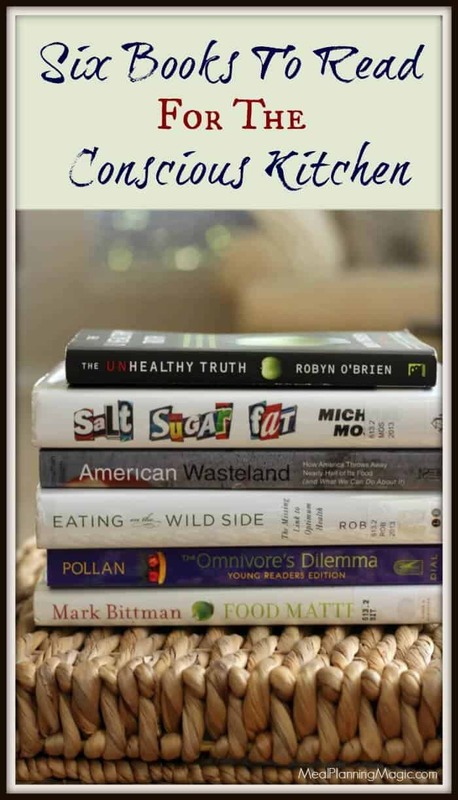 So I’ve rounded up these Six Books To Help You Understand the Food You Eat to help you understand the food you eat so you can make more informed decisions for your family. It’s by no means comprehensive and I know there are LOTS more out there. But these are books that I either own or have checked out of the library more times than I can count because there was something in them that just made sense to me and in turn, has influenced the foods we choose for our family to purchase and eat on a regular basis. These books will hopefully make you think but are not too heavy to bring you down. Mark Bittman is one of the country’s best-known and widely respected food writers. In his book Food Matters, he takes you through why and how the food sold in the grocery store is what it is today and where it comes from. He talks about how the food we eat impacts our planet and our bodies. One thing I especially liked was how he explains different food terms. Of note, two-thirds of this book is recipes, many of which look pretty simple. 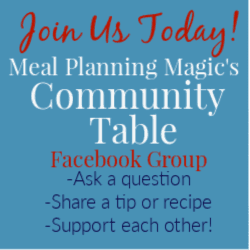 Many of the recipes offer suggestions on how to customize flavors to your preferences. Bittman offers ideas that make earth-friendly doable and appealing. Did you know that over 40% of all food in the United States is wasted? That’s food that is not making it into hungry families’ tummies or food that is costing us hard earned money and never being eaten. I first heard about this book on a radio program on satellite radio and I immediately looked it up. Author Jonathan Bloom examines this history of how we got to this point and where the food waste is occurring. Surprise to me—it’s not so much in our own homes but also in restaurants when we don’t finish what we order (or take leftovers home) or what is not picked in the fields where food is grown only to be left behind because it’s “unsellable” in the grocery stores (which also have a tremendous amount of waste). He talks about those sometimes confusing expiration labels of Best By, Sell By and Use By (which contributes to food waste because we’re not always sure if it’s still ok to eat. Backed up by tons of research that is well noted, Bloom also provides simple steps on how to reduce food waste in your own home and community. This book has changed my life. I won’t say we’re free of food waste in our family, but it definitely helped me reframe how I shop (only buying what I think we’ll REALLY eat before it spoils) and even working with local food pantries to help them connect to grocery stores to receive food that is past it’s prime for retail sale but still perfectly edible as it may not have reached its expiration date. I even created a Food Waste Family Pledge that helps the whole family understand how food waste can save money too! This book was incredibly eye-opening to me! Pulitzer Prize–winning investigative reporter Michael Moss takes us into his investigation of the food industry in America. If you’ve wondered why the current obesity epidemic is such a complicated one, Moss examines part of the puzzle to reveal that the food industry may have more to do with it than you might realize. I found this book to be pretty in-depth (i.e not super easy reading at times but not terrible either) but it is very well researched and documented. Part history lesson part expose’, Moss shares how the food sold in grocery stores today has evolved in last few decades and how big food executives and marketing have influenced those changes. Definitely worth a read as part of your food discovery research. Designed for ages grade 7 and up, this book, based on Pollan’s best-selling book of the same title, this version is meant to appeal to teens who want to learn more about the food they eat. It’s written in a way that doesn’t dumb things down but still presents information in a format that is easy for young readers to understand and implement change in the food choices they make. The book is divided into four sections: “The Industrial Meal” (exemplified by the fact that only two companies, Cargill and ADM, buy nearly a third of all the corn grown in the U.S.); “The Industrial Organic Meal” (covering most of what’s found in stores like Whole Foods); “Local Sustainable” (small farms typically based on grass, not corn); and what he calls the “Do-It-Yourself Meal” (where he hunts a wild pig and gathers wild mushrooms). Again, this book is backed up by lots of research (which I love in a book), it also includes some tips in the “Vote With Your Fork” section for actionable items and a Q&A with the author that provides some additional insight as to why he’s on this journey to change the way people think about the food they eat. I originally stumbled upon this book in the library and I’m glad I did. Another well researched book about how foods have changed over thousands of years since our ancestors first started growing and eating them (lettuce and potatoes were two examples I found to be very interesting). The author provides many good action items on what to look for in foods that maintain optimum nutritional benefits. Each chapter focuses on a different food or related group of foods. She also compares why choosing fresh vs. processed foods matters to our health. What I especially liked about this book is that it gives a little history of the fruit, vegetable or legume and then differences in varieties, how to store and how to prepare. Note: there are no recipes. Rather, this book is meant to be general guide to help you choose the ingredients to use in your own recipes. Disclaimer: Many of the links in this post are affiliate links which means if you choose to make a purchase, at no extra cost to you, I may receive a small commission. Thanks for your support!